J D Automotive & Truck Inc Offers Auto Repair Services You Can Count On! 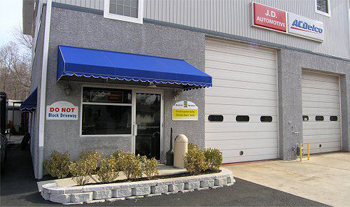 Since 1995, J D Automotive & Truck Inc has provided motorists in the Dover, NJ 07801 area with comprehensive auto repair services that include Brakes, Car & Truck Care, Domestic Cars & Trucks, Electrical Services, Electronic Services, Engine & Transmission, Engine Maintenance, General Services, Heating and Cooling Services, Import Cars & Trucks, Inspections and Emissions, Miscellaneous Services, Tires, Towing, Transmission Services and Undercar Services. Our goal is to offer the best services available at affordable prices to get you back on the road in no time. For a high-performing vehicle, trust J D Automotive & Truck Inc with your car, truck, or van. To learn more about the services we offer, please contact us by phone at 973-366-0799 or send us an email. We also invite you to learn more about our dedication to you, our valued customer. JD Auto and Truck provides reliable, great service. I know, when I make an appointment, they aren't going to try and sell me something I don't need. I can trust them and that's important to me. Their waiting room is humble, but they offer coffee and they have wifi. If your repair is going to take a while, they can offer you a local ride so you can avoid hanging out there all day. Bottom line is they're friendly, honest, hard working auto mechanic's who know what they're doing, and isn't that what we're all looking for? Everyone here is very knowledgeable, they have state of the art facility. Plus all of their mechanics are highly experienced with top certifications. Their front desk Nick is very patient and friendly. They can find any problem and you can trust everyone here to make sure your vehicle is in the best hands possible. Trained & knowledgeable mechanics who will take the time to thoroughly discuss issues with your vehicle. Confidence that when your repairs are complete "they were done right". Shop organization & housekeeping is top notch. Always took my vehicles there when I lived in the area. Great service, always done right. My car came back to me better than ever. I had no issues at all and everything was BS free. It can be hard to find professional service and that's what I received here. They were accommodating and honest. ...you do always get what you pay for. They will find and fix any problem fast and right the first time. No games here. They fix only what needs to be fixed, and more importantly don't break something else while fixing your problem like other more shoddy garages might, saving both time and money in the long run. I have been taking my 1996 Honda to JD for the last 3 years now. I have 200K miles. They have never steered me wrong. They get the job done right, the first time. They are very knowledgeable and experienced. They are not cheap, probably the same rates as most good auto shops and dealers, but you get what you pay for. I don't take my car anywhere else and I recommend them highly. Been going there for awhile. Very satisfied with the work. Good people. Honest. Would highly recommend this place. If you think they might be over priced, remember one thing. You get what you pay for. Clean facility. Very Honest. I have been taking my vehicle to JD for about 3 years now and they have always been very honest with me and the job is always done right and very fast. I highly recommend this shop.